The G5RV center feeder used by LX4SKY. The dimensions of the antenna and its matching section are shown in the drawing displayed below. The "flat-top" should, if possible, be horizontal, run in a straight line, and should be erected as high as possible above ground. In describing the theory of operation, it has been assumed that it is generally possible to erect the antenna at an average height of about 10.35 m (34 ft), which happens to be the optimum radiation efficiency on 160, 80 and 40 m bands for any horizontal type antenna, in practice few amateurs can install masts of the optimum height of half a wavelength on 80 or 40 m, and certainly not on 160 m.
If, due to limited space available, or to the shape of the garden, it is not possible to accommodate the 31.1 m (102 ft) top in a straight line, up to about 3 m (10 ft) of the antenna wire at each end may be allowed to hang vertically or at some convenient angle, or be bent in a horizontal plane, with little practical effect upon performance. This is because, for any resonant dipole antenna, most of the effective radiation takes place from the centre two-thirds of its length where the current antinodes are situated. Near to each end of such an antenna, the amplitude of the current standing wave falls rapidly to zero at the outer extremities; consequently, the effective radiation from these parts of the antenna is minimal. The antenna may also be used in the form of an inverted-V (L). However, it should be borne in mind that, for such a configuration to radiate at maximum efficiency, the included angle at the apex of the L should not be less than about 120° (although many authors consider an opening between 90-120° only); The use of #14 AWG (inner Ø 1.63 mm) enameled copper wire (stranded) is recommended for all models, although thinner gauges such as #16 (inner Ø 1.31 mm) or even #18 AWG (inner Ø 1.04 mm) solid wire can be used. If the wire has to sustain a strong traction, a stranded steel wire of #14 AWG protected with PVC is also suitable. Close-up on the copper ladder constituting the matching section, made of thick copper wire #16 AWG (inner Ø 1.31 mm). If it is desired to use 300Ω ribbon type feeder for this section, it is strongly recommended that the type with "windows" (ladder line) be used because of its much lower loss than that with solid insulation throughout its length, and its relative freedom from the "detuning" effect caused by rain or snow. If this type of feeder is used for the matching section, allowance must be made for its velocity factor in calculating the mechanical length required to resonate as a half-wave section electrically at 14.150 MHz. Since the velocity factor of standard 300Ω ribbon feeder is 0.82, the mechanical length should be 8.5 m (28 ft). However, if 300Ω ribbon with "windows" is used, its velocity factor will be almost that of open-wire feeder, say 0.90, so its mechanical length should be 9.3 m (30.6 ft). This section should hang vertically from the centre of the antenna for at least 6.1 m (20 ft) or more if possible. It can then be bent and tight off to a suitable post with a length of nylon or terylene cord so as to be supported at above head-height to the point where, supported by a second post, its lower end is connected to the feeder. But contrarily to coaxial, a ladder line has two big advantages on the coaxial. First, as we told previously a ladder line offers the lowest RF loss on HF frequencies, even when the SWR is relatively high on the feed line to the antenna. Then, connected to an external antenna tuner, a ladder line doesn't require pruning to render the lowest SWR on each operating band. Simply attach your ladder line at your wire antenna and let the antenna tuner worry about providing the lowest SWR for the transceiver. This is simple and efficient ! In other words, a ladder line is much less complex to use that a coaxial; you have only to sit down in front of your radio to go on the air, without squinting at the antenna tuner's SWR meter and twisting several knobs to accomodate the lowest SWR. Using a coaxial you will probably find that you need to readjust the tuner when you go away from the central frequency (over 200 kHz or so) and surely when you will change of band. There are at least three ways to make the matching section : using an open wire, a ladder line (standard) or a TV Twin-Lead. Its end is connected to an external tuner linked to an ordinary coax to the radio. The full-size G5RV works on the 160 m band too if the station end of the feeder (either balanced or coaxial-type) is strapped and fed by a suitable antenna tuner using a good earth connection or a counterpoise wire. In all cases the length of the matching section must be near 10m and should not be in contact with the ground and kept clear of large pieces of metal (> 10 cm away). Ideally this dipole must be placed over 10m high. Recent experiments by Louis Varney to determine the importance or otherwise of "unbalance" effects caused by the direct connection of a coaxial feeder to the base of the matching section had a rather surprising result. They proved that, in fact, the HF currents measured at the junction of the inner conductor or the coaxial cable with one side of the (balanced) matching section and at the junction of the outer coaxial conductor (the shield) with the other side of this section are virtually identical on all bands up to 10 m, where a slight but inconsequential difference in these currents has been observed. There is, therefore, no need to provide an unbalanced-to-balanced device at this junction when using coaxial feeder. However, the use of an unbalanced-to-unbalanced type of antenna tuner between the coaxial output of a transceiver and the coaxial feeder is essential because of the reactive condition presented at the station end of this feeder which, on all but the 20 m band, will have a fairly high to high SWR on it. This SWR, however, will result in insignificant losses on a good-quality coaxial feeder of reasonable length; say, up to about 21.3 m (70 ft). Because it will, inevitably, have standing waves on it, the actual characteristic impedance of the coaxial cable is unimportant, so that either 50Ω or 80Ω type can be used. Another very convenient type of feeder that may be used is 75Ω Twin-Lead. However, because of the relatively high loss in this type of feeder at frequencies above about 40 m, especially when it has a high SWR on it, it is recommended that not more than about 15 to 18 m (50 to 60 ft) of this type feeder be used between the base of the matching section and the antenna tuner. Unfortunately the 75Ω Twin-Lead in the UK is the receiver type; the much less lossy transmitter type is available in continental Europe and in the U.S.A.
By far the most efficient feeder is the "open-wire" type, although it is rarely used. A suitable length of such feeder can be constructed in exactly the same way as that described for the open-wire matching section. If this form of feeder is employed, almost any convenient length may be used from the centre of the antenna right to the antenna tuner (balanced) output terminals. In this case, of course, the matching section becomes an integral part of the feeder. 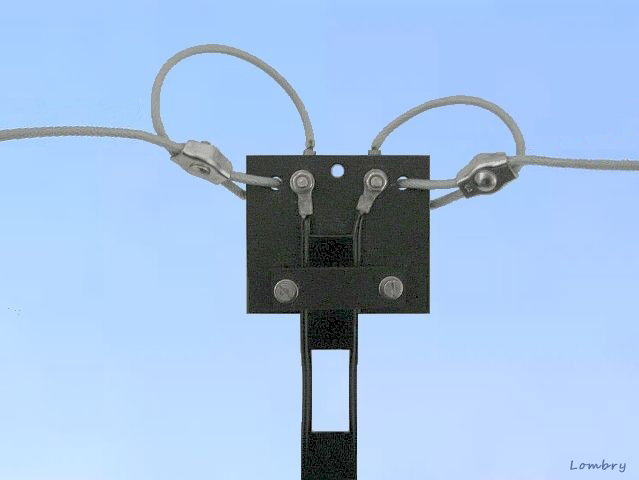 A particularly convenient length of open-wire feeder is 25.6 m (84 ft), because such a length permits parallel tuning of the antenna tuner circuit on all bands from 80 to 10 m with conveniently located coil taps in the antenna tuner coils for each band, or, where the alternative form of antenna tuner employing a three-gang 500 pF/section variable coupling capacitor is used the optimum loading condition can be achieved for each band (see AA5TB page about a homebrew antenna tuner). However, this is not a rigid feeder length requirement and almost any length that is mechanically convenient may be used. Since this type of feeder will always carry a standing wave, its characteristic impedance is unimportant, and sharp bends, if necessary, may be used without detriment to its efficiency. It is only when this type of feeder is correctly terminated by a resistive load equal to its characteristic impedance that such bends must be avoided. Louis Varney didn't deal with this solution that can be very useful if you want to work with a half-size dipole cut for 7 MHz (about 20 m long) on harmonics like the 15 m band. But we all know that this wavelength is out of band for phone work (USB) in most ITU Regions (because 7.2 x 3 = 21.6 MHz). By what miracle can we use this dipole on 21 MHz ? The solution is really simple and consists in charging the antenna with a capacitance hat, one on each segment. How to proceed ? A summary of this article was printed in RADIO COMMUNICATIONS, July 1984.